Raising Finds, Selling Custom T-shirts, and Raising Awareness has never been easier! 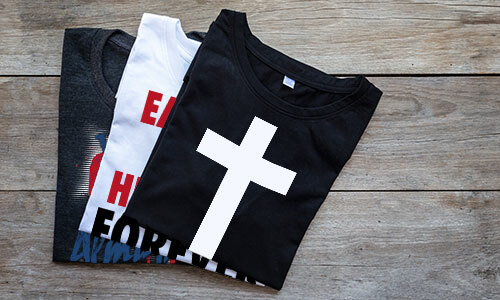 Sell custom t-shirts and take donations with no inventory, hassles or risk. just design your shirt, share why you are raising and the share your campaign. We fill the orders and send along the funds you raise! Fundraising is a great tool for any Christian group, cause or community. Upload your image, or have our design specialists create a design for you. They will help you to set up colors, garments, pricing and fundraising goals. Promote yourself! Let people know how easy it is to purchase one of your shirts!